Today my hair needed to be up, because I simply felt like it! :) I usually just pull it all back, but today I did something different to it. I then tied it all up in a ponytail with a hairband, and plaited a section of it and wrapped it all the way round to hide the hairband. This is what it looks like from the front, quite subtle... but interesting! Do you do random casual updos like this? that looks really lovely on you! Wow your hair looks really pretty, I don't think i would be able to recreate that! 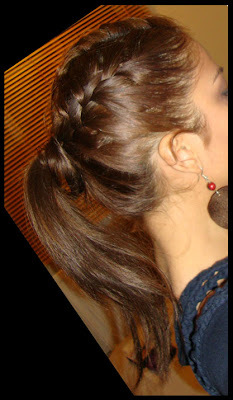 That looks so cool...I wish I wasn't such a lazyyy with my hair - usually its just in a high bun! I have SO much hair, its a mish. I can't french braid my own hair to save my life, but you have quite a talent for it! :) Love it. Love that scarf too! You're so adventurous when it comes to your hair, makeup, clothes, accessories... I love that about you! Wish I would step out of my comfort zone and be more like that! I love the hair! :) You look gorgeous! oh my god I love your hair. It looks so elegant! I wouldn't be able to do that in a million years! Love it though!!! It really suits you! btw,it's amazing how good it looks good on you. ponytail (and combed-back hairstyles in general) don't look this good on many woman. I think it's something about the ratio between forehead and the whole face. I wish I had enough gorgeous hair like yours to do the styles you do (sad face) I am insanely hair-jealous! Love the french braided ponytail..whenever I try to braid my hair I end up taking out within minutes..it really suits you! It looks great, and I really love your hair color. How the hell do you do french braids on yourself? I always have to have my mom do it on me lol. The eye makeup ROCKS by the way. please do a tut! That hairstyle is so cute! I wish I could manage stuff like that but I am so useless at french plaits, I can't even do it on someone else's hair! This looks amazing! 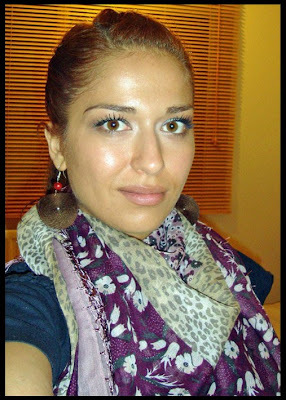 I'm good to try it this weekend :) Beautiful scarf too! That looks beautiful! I wish I could do that too. very stylish! my bangs always look wonky when I try to incorporate them into french braids, but I have always loved that look. @patricia indeed they do, li lash update soon :) i cant wait to compare b4 and after pics!